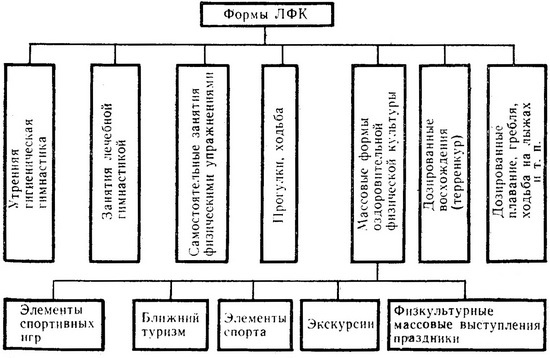 There are many forms of medical physical culture: morning hygienic gymnastics, exercise gymnastics, individual exercise, therapeutic dosed walking, dosed climbing (path), mass forms of health physical culture, dosed swimming, boating and other (see diagram). Morning hygienic gymnastics is running specially selected physical exercises that contribute to the body of the state braking (sleep) to active mode of the day. For a follow-up phase of rehabilitation morning hygienic gymnastics can be performed in the open air, combining it with a short walk. The lesson of therapeutic gymnastics is the basic form of medical physical culture, aimed at restoration of function of the affected organ and the whole body. The lesson consists of three parts: introduction, main and final. In the first provides basic gymnastics, respiratory exercises, preparing the patient for increasing physical activity. Second, special and General developmental exercises that have a positive impact on the affected organ and the whole body of the patient. The third included elementary gymnastics and breathing exercises to relax the muscles, reducing physical activity and contributing to the restoration of physiological parameters. Individual therapeutic gymnastics are sick, how to exercise and consciously related to the quality of their performance. Exercises for them are specialists in therapeutic physical culture, taking into account individual peculiarities of each patient. Independent studies conducted with the preventive purpose, are built on the basis of recommendations of experts and recommendations received through the media (TV and radio programs, special literature and so on). Therapeutic dosed walking is for the normalization of gait after traumas and diseases of nervous system, musculoskeletal apparatus, metabolic, cardiovascular and respiratory systems, as well as adaptation of the body to stress. Therapeutic dosed walking speed, long distance, the step length, area relief, the quality of the soil. This walk is independent form of medical physical culture, in contrast to walk as sports and applied exercises used in the lesson, therapeutic exercises as a means of medical physical culture. Dosed climbing (path) - treatment dosed walking with a gradual ascent and descent on special routes. This form of exercise is used in diseases of the cardiovascular, respiratory, metabolic disorders, traumatic lesions of locomotor system and nervous system. Depending on the steepness of the ascent routes terrenkura are divided into groups with angle of elevation 4 - 10to, 11-15°, 16-20 degrees. The most famous routes of health path in Kislovodsk, Yessentuki, Sochi, Gurzuf, Yalta. Dosed swimming, boating, skiing, skating and other may not be the only means of medical physical culture (as a variety of sports and applied exercises), but also independent form. They are designed to further exercise of the functions of the affected organs and the whole organism, increase efficiency of recovering, disease prevention. This form of exercise is applied individually, taking into account indications, contraindications and appropriate dosages. Recently it has been widely used in the rehabilitation of sportsmen, persons of young and middle age. To mass forms of recreation physical culture are elements of sports, close tourism, elements of sports, mass gymnastic performances, holidays. These forms are selected and dosed individually. They are applied in the period of recovery, with the aim of training of all organs and systems. Mass forms of medical physical culture can be used for preventive reasons, especially in the group of health resorts and in sanatoriums.